I found a great fish in that wonderful publication The Mailbox, that I had to share with you. There is another fish craft from there which I will share at another time. 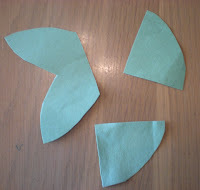 Cut a triangle out of the paper plate for the fish's mouth. 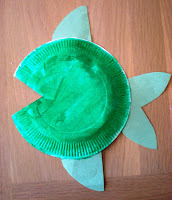 Then cut two fins and one tail from construction paper. Glue the fins and tail to the plate. 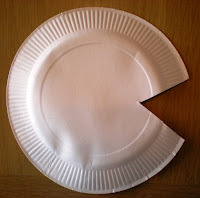 Paint the paper plate. I used green, but any color will do. 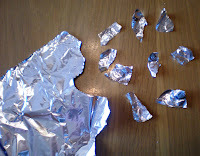 From a piece of aluminum foil let the children rip some pieces to represent the scales. The foil rips pretty easily. 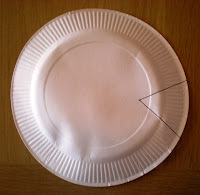 Glue the scales to the dry paper plate. Finally, add an eye. I thought this fish could use a big old googly eye, but I don't have any at the house, so I made an eye from construction paper. I thought this fish would look great hanging somewhere it would catch the sun's rays. A few notes about the project. My original plan was to paint the fins and tail along with the plate, that is why I glued them on before I painted. Then, as I was painting I thought it looked neat with the different colors. If I was doing this at school, I would probably have the children paint the plate first, then add the fins and tails after it dried. 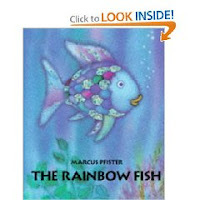 Another thing I thought is this would make a great activity with the story "The Rainbow Fish," by Marcus Pfsiter. This is a wonderful story about sharing your blessings with others and the joy it can bring you. 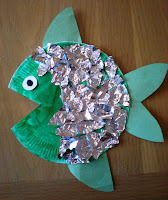 For other "Rainbow Fish" activities, check out Sandra's post at Preschool to Pre-K and More. 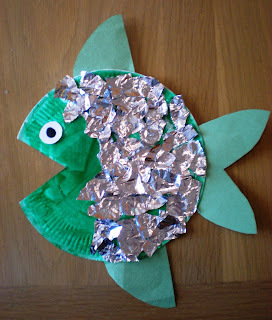 That's so funny-we actually did this craft a few weeks ago to go with the story Rainbow Fish! It was great fun. Thank for for sharing that craft idea. 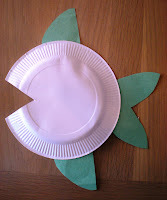 I love your paper plate fish, he's adorable. 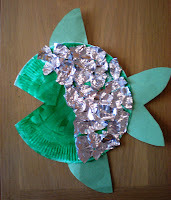 Thanks for posting a link to my blog on our Rainbow Fish book activities and rainbow fish craft. I posted about this book on my blog too! It's my favorite summer book for children in my group. I really like the pinwheel craft. Will have to bookmark this one for letter "Pp". Thanks for sharing! This is SOOOO cute! Saving the idea for the upcoming preschool year!